As a business owner, hiring the right people for the job is paramount to your long-term success. Unfortunately, finding qualified people in the HVAC, plumbing, and electrical industry is becoming more and more challenging. After decades of pushing students to pursue academic degrees from four-year colleges, the United States is facing a skilled worker shortage of historic proportions. High schools no longer offer shop classes introducing students to the trades. With fewer young people entering the industry and much of the existing workforce approaching retirement, the situation is bound to get worse before it gets better. Nexstar Network has responded to this shortage of skilled tradespeople by developing NexTech Academy, an online technical training program for residential HVAC, plumbing and, in 2020, electrical technicians. Members of Nexstar Network are able to enroll students with little or no previous trade experience in one of these comprehensive training programs to help build a qualified workforce. Rather than relying on trade schools or vocational programs to train future employees, the NexTech Academy curriculum is designed to help businesses develop the workforce they need more efficiently and cost-effectively. Through online learning and hands-on skills assessments, participants get the step-by-step technical training they need to become technically proficient in their chosen trade. Additional soft skills training prepares them to go into the field and build relationships with customers. The result is a well-rounded technician who is not only qualified, but confident and professional. Online training programs cost less. The cost of enrolling students in NexTech Academy is significantly lower than traditional vocational training programs, which can cost upwards of $1,200 for a certificate program or more than $20,000 for an associate degree. Whereas the cost of an online technical training program may be as little as $800. NexTech Academy uses a monthly subscription model, which further minimizes the expense if a student begins the program but later decides it isn’t the right path for them. We understand the frustration that comes with trying to not only recruit, but train new employees from the ground up. Developing your own technical training program can be time-consuming and costly. With NexTech Academy, you simply provide the people and access to our online resources and we’ll handle the rest. Our proven training curriculum is backed by Nextar Network’s 26+ years of industry experience. We integrate Nexstar best practices with step-by-step technical training to help employees with little trade experience become a confident and competent technicians. Our unique online learning model gives students the flexibility to learn at their own pace, and in their own way. We use a variety of educational methods to deliver content that accommodates students with different learning styles, including reading assignments, videos, and interactive exercises, quizzes and hands-on skills assessments. We also understand that training doesn’t happen in a vacuum. These are physical jobs that require hands-on knowledge of the equipment and systems technicians will be responsible for in the field. NexTech Academy gives you the best of both worlds by utilizing online courses as well as hands-on training. We couple our online training with dedicated technical coaches for our members. Our coaches work with your business managers and training leaders to reinforce the content that employees learn through NexTech Academy to produce technicians that deliver. Soft skills training prepares students to interact with customers. What truly sets NexTech Academy apart from other vocational training programs is the soft skills training that is integrated into our curriculum. We teach students the customer service skills necessary to interact with clients in the field. This unique aspect of our training ensures graduates who complete our program will be able to empathize with customers, help them choose a repair or replacement that meets their needs and confidently perform that work. Students enrolled in the NexTech Academy HVAC technician training program will acquire a working knowledge of tools, technical drawings, equipment, blueprints and materials. 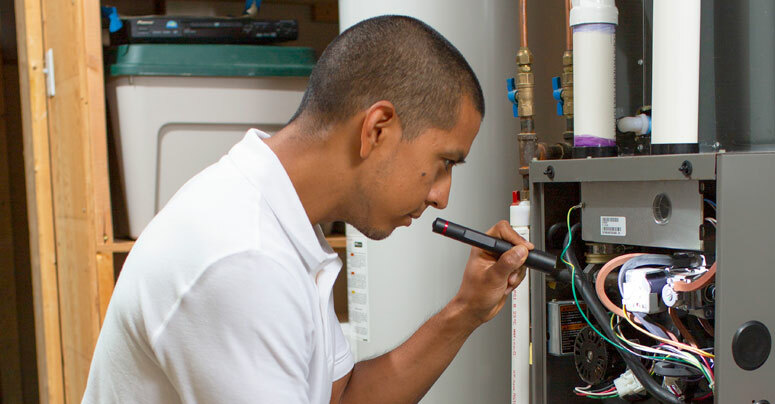 The course also includes furnace and A/C system maintenance, troubleshooting and installation. Plumbing training students begin with the basic principles of plumbing, followed by training in drain systems, vents, water lines and fixture installation. The advanced course curriculum focuses on troubleshooting, hydronic and solar water heating systems, private wells and septic systems, and plumbing system design and installation. The NexTech Academy electrical training program will be available in 2020. Our coaches, instructional designers, business leaders and training professionals are working hard to develop a curriculum for students interested in pursuing a career as an electrician. Create confident technicians with our flexible vocational training programs. While NexTech Academy is not a “fast track to a truck” program, our online technical training programs can be completed in roughly 18-24 months, compared to most apprenticeship programs, which work on a four- to five-year model. However, the pace of the program is determined by how much time a student can devote to it during the work week. NexTech Academy provides students with the online technical training, hands-on skills assessments and sales and service skills they need to begin a rewarding career in one of these skilled trades. Your business and the industry will gain a well-rounded technician who is not only qualified, but confident and professional. Let us help you develop the workforce you need. Learn more about HVAC technician training, plumber training, and electrical training programs available through NexTech Academy.